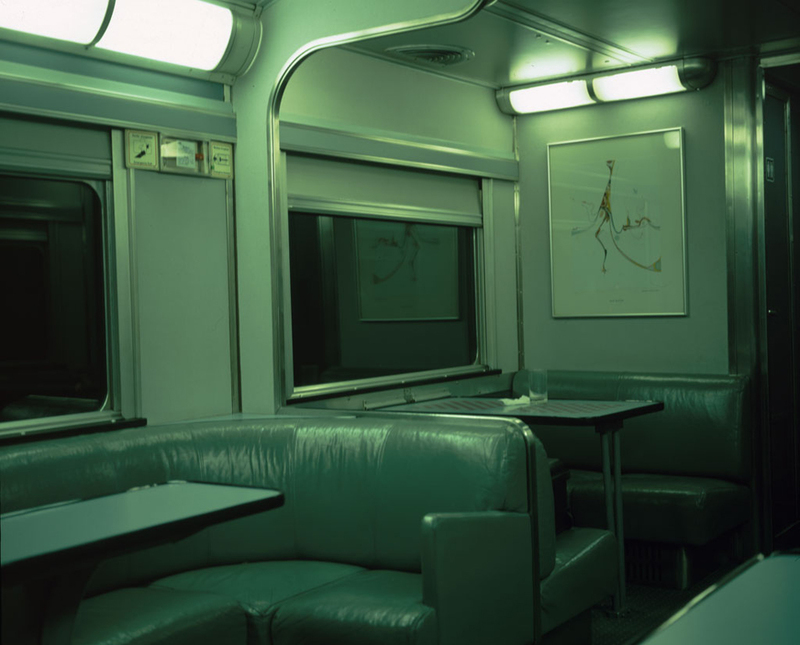 Deadman’s Switch is a series of 8 photographs of empty VIA rail passenger cars, documenting the cross-country journey by train from Vancouver to Halifax and back to Vancouver again. This series uses Canada’s declining railway system as a physical metaphor, to explore themes of direction, destination, transience, and infrastructure. The object of this project was to document the cross Canada journey with no landscapes and no people. Conventionally when people think of explicitly “Canadian” art (be it literature or visual art), they often instinctively think of images and stories that involve landscape or portraits of people. In this project, I wanted to explore something quintessentially Canadian, without the common tropes of landscape and portraiture. The railway played a major role in the unification of Canada as a nation, and yet it’s history is riddled with controversy and conflict. Here in New Brunswick, the railway was once a major economic force before the CN shops shut down in Moncton. Currently the rail system is in decline, with few passengers, and therefore fewer trains operating, as well as with an increase in freight derailments. On a personal level, I grew up as the daughter of a CN rail worker, and therefore, trains and heavy machinery played a major role in the cultural landscape of my youth. These photographs were taken when I was working on a film that was funded by SSHRC (Social Sciences and Humanities Research Council of Canada). The film was called “Fallen Flags” and it featured images of empty passenger cars, and a soundtrack filled with voices and laughter of passengers. A “fallen flag” is a rail line that has been discontinued and is no longer in service. The photographs for Deadman’s Switch were taken during that filmmaking trip in 2005, but never printed until now in 2013. In the intervening years between 2005 and 2013, I have made other films about the train, including Mechanical Memory, and Mechanical/Animal Memory, both of which focused on freight trains, tie gangs, my father, and my childhood. Deadman’s Switch is a colder and more disembodied look at the passenger rail service. All photographs were taken in the very early morning, while the other passengers were still sleeping (I did my work well after midnight or between 5:00 and 6:00 am). 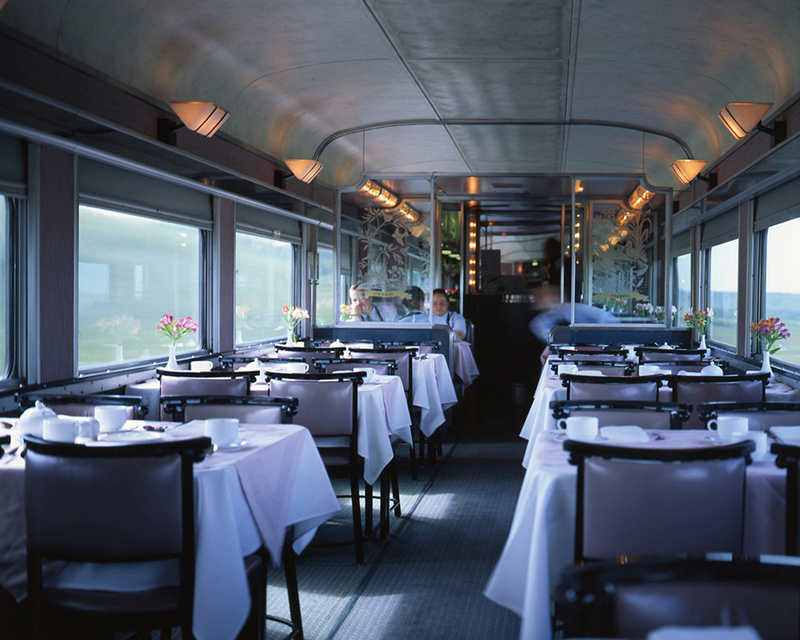 Images were created using long exposures (sometimes over 1 minute on a moving train) on Fuji Velvia 4x5 transparency film with a Toyo large format field camera. The primary edition for museum and art collectors is an edition of 1, mounted on aluminium and facemounted with acrylic. In addition, there will also be a second edition of 2 on photo paper which can be framed. All prints (for both editions) are printed and mounted at Toronto Image Works.